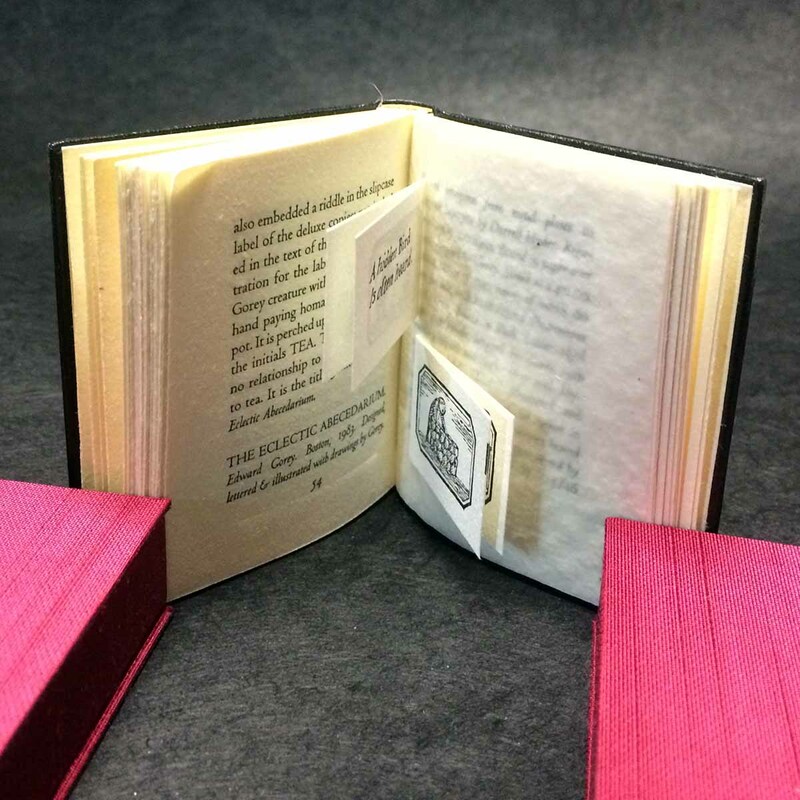 Twenty-six years after their last publication, Anne Bromer has written a memoir of the eleven printed miniature books she produced with her husband and partner David from 1977 to 1989. In the book - itself a miniature (2.25 x 2.75 inches, 72 pp.) - she relates brief stories of pleasure, coincidence, and difficulty for each of their publications, followed by a detailed bibliographic description. XI LXIVMOS is set in eight-point Centaur and Arrighi types, and printed with a Ostrander-Seymour Co. handpress on dampened papers. the miniature comprises 72 pages and measures 2.25 x 2.75 inches. A deluxe edition of 35 copies (I-XXXV) was printed on F.J. Head handmade paper, with each copy including four sample leaves from the books. Original calligraphy on the title page and colophon in each copy by Francesca Lohmann. 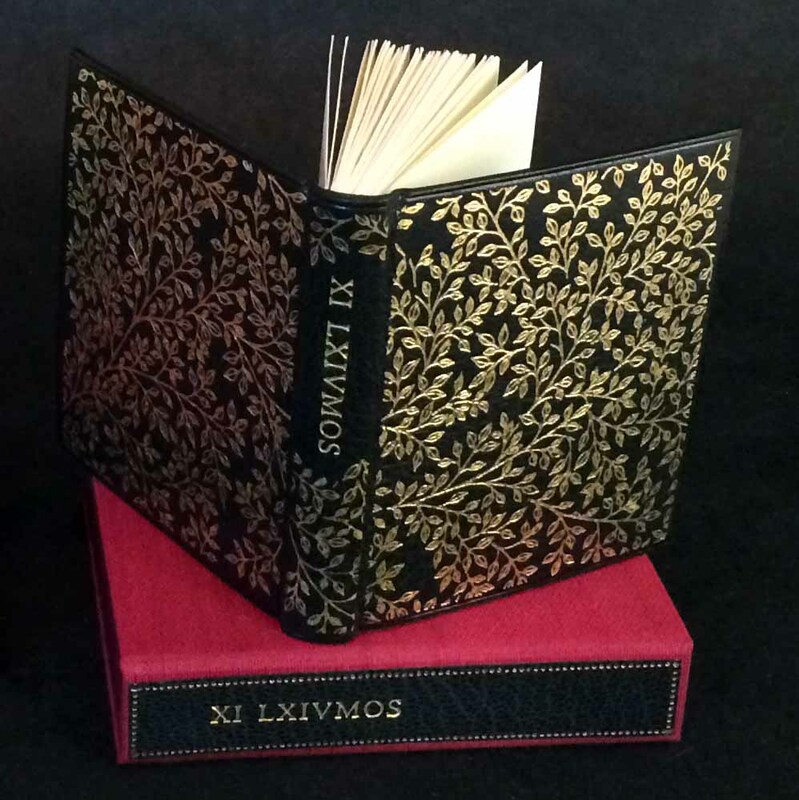 These copies are bound in full leather by Sarah Creighton, with the vine pattern stamped in gilt. Issued in a folding box. The regular edition of 85 (1-85) copies was printed on Somerset Book paper, and bound by Sarah Creighton in a printed vine-patterned paper over boards. The design was created by Francesca Lohmann, who also drew the book’s interior foliage. Jointly published by Heavenly Monkey and Bromer Booksellers of Boston, MA.